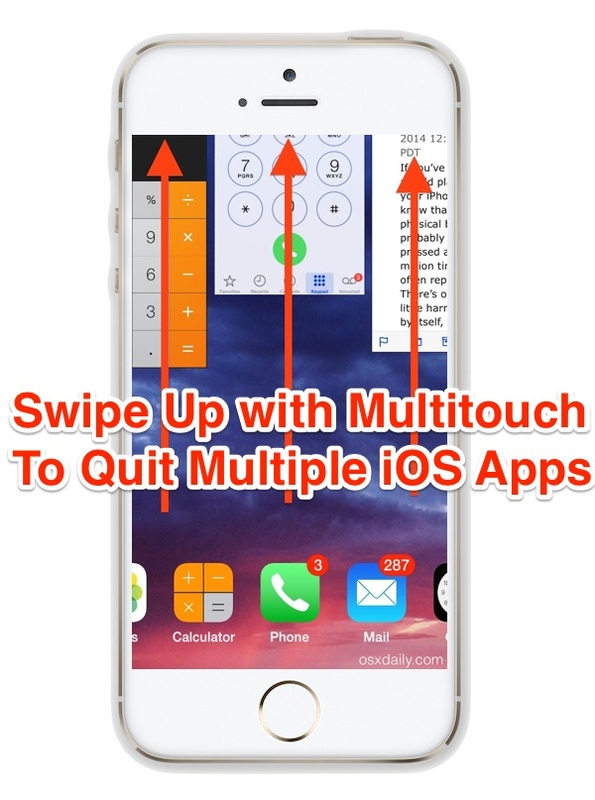 If you ever need to quit out of more than one app on the iPhone, or quit a bunch of apps quickly in iOS, using a handy multitouch swipe gesture at the iOS multitasking screen is enough to quit apps simultaneously. This works really well to quickly clear out the multitask bar of all running apps if you need to for whatever reason, and you can quit as many apps at a time as that fit on screen (and that you can fit fingers onto), which usually means killing running apps in groups of three. 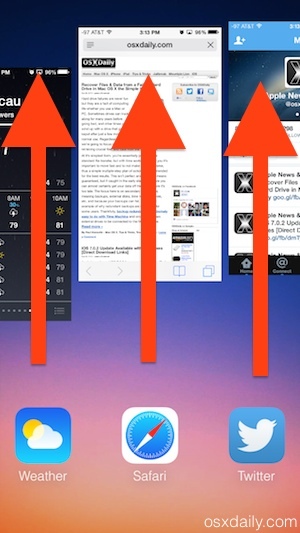 You may already be aware of this, since it’s really just a modification of the single swipe up to quit an app trick that was newly introduced in the redesigned 7.0 release of iOS, but the multitouch ability to close out of groups of apps together is apparently lesser known, and the feature continues on through iOS 8. For best results, you’ll want to swipe over to where three apps are visible at a time – thereby allowing for three apps at a time to be quit – otherwise the home screen panel remains visible on the left side, and you’ll only be able to swipe up onto two apps at a time. For best results you’ll want to use three fingers spread apart a bit, which moved quickly can clear out a huge amount of running apps in just a few seconds. This is definitely much faster than swiping up one-by-one on each individual app in the multitasking preview panel. This particular multi-touch swipe trick works the same on any iPhone, iPad, or iPod touch, so long as they are running a modern version of iOS, from 7.0 onward and iOS 8. 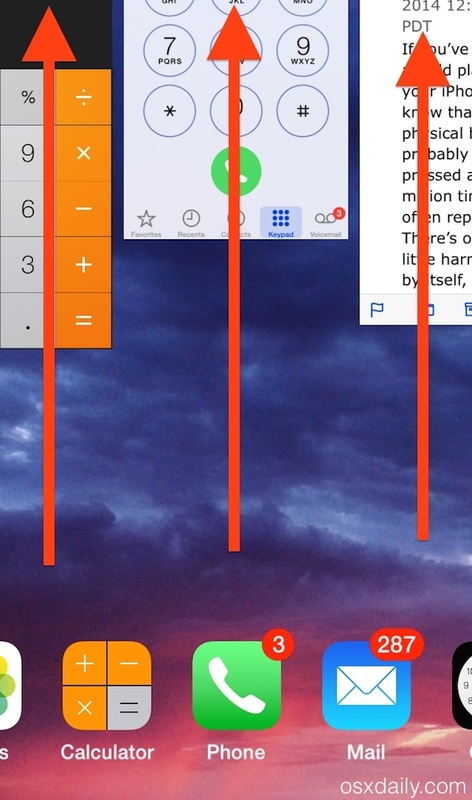 Prior versions of iOS also supported a variation of a different multitouch method of quitting multiple apps at the same time, but rather than using a swipe-up gesture at the multitasking panel, they used the older style task bar with multiple touch points to exit out of groups of apps. It’s hard to say which is easier to learn, but the swipe-up trick is simple and intuitive once you become aware of it, and it’s certainly more forgiving than trying to tap on the small touch targets of the little (x) button that existed in older versions of iOS. I disagree, if an app is frozen, unresponsive, or misbehaving, you’ll want to quit it and relaunch it. Also, if an app is running in the background and doing something you don’t want it to do (like using location services), you can quit it to stop that activity. But for the most part, you are right, outside of troubleshooting there is little reason to quit apps. People parrot this line of “you don’t need to quit apps in iOS!” because they read it on some blog post that Unofficial Apple Messiah John Gruber linked to a few months ago, but it’s complete and total BS. You DO need to quit apps sometimes if they are crashing or doing anything you don’t want them to do. Here’s a big whopper of a hint: if you never needed to quit iOS apps, why on earth do you think Apple would include the ability to quit apps in iOS? There’s your answer. 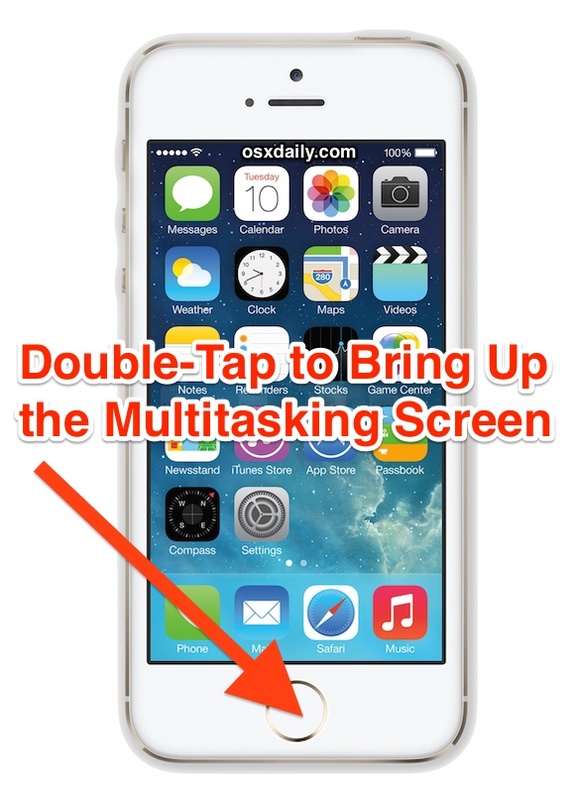 I think most of iPhone (or iOS) users already knew this trick. But it’s really nice of you to explain it in a vivid way. Thanks! I wonder why in many of the article titles the reference keeps pointing to the iPhone when the solution(s) apply equally to the iPad. So “How to Quit Multiple iOS Apps” seems to be the better option as it would also make an iPad only owner read the article. I’d think referring to the iPhone is applicable when it doesn’t apply to the iPad which sometimes happens. In this particular example it’s because the screen shots for the walkthrough are taken from an iPhone, but yes indeed this works on the iPad and iPod touch too! I just removed this site from my feed for this. People don’t need to close apps on heir iOS devices. Making articles like this reinforces the impression that they need to. Let’s stop telling people to do that. You removed us from your feed because we’re teaching people how to use functions on their iPhone? Seems silly that you’d prefer people to not be aware of iOS features, but alright, thanks for that feedback. BTW, in case there was any confusion, this is a “How To” article, it describes how to do something, it’s not a commandment. If most users already know this trick then I am in the minority. I knew about closing apps one-at-a-time but not about closing multiple apps at once. These “simpler” tips are much more useful to me than “complicated” tips like Command Line tricks that I have never ventured to use. Force quitting apps in iOS is not necessary unless there is an issue with the app itself. This does not save battery life. When pressing the home button, the app pauses unless it was designed to run in the background (which is rare) like Skype. Quitting apps can save battery life if they are actively doing something or running in the background, whatever the app. Location apps are notorious for this reason, they sit in the background and drain battery as they ping GPS, it’s good to quit them when they’re not in use. But anyway, this is about quitting multiple apps at a time, not about battery life. This is an insufficient and needlessly cumbersome technique. There should be a easy one-two step method of closing all apps simultaneously. And whether or not I “need” to close all apps, I simply want to be able to do so. I don’t need others to tell me what specifications I want on my iPhone. If I want to remove clutter easily, why not?